The wraparound service model will change how providers serve families. Work with families will begin much earlier. Discharge planning for youth in residential care will begin on the day they are admitted- and we will need to become much more flexible and creative. This means that we may create services to meet the individual needs of a family or youth and that we will use less formal services. Supports one child and family team across all service environments. Allows the family’s wrap-around plan to unify residential and community treatment. Helps families build long-term connections and supports in their communities. Provides concurrent community work while the youth is in residential care for a smooth transition. Reduces the occurrence and negative impact of traumatic events in a child’s life. Provides access to mobile crisis support, 24 hours per day, seven days per week. Supports crisis stabilization without the need for youth to enter/re-enter residential care. The Safe at Home West Virginia model emphasizes the importance of family engagement, recognizing that the likelihood of successful outcomes and youth and family ownership of the wraparound plan are increased when the wraparound process reflects family members’ priorities and perspectives. Safe at Home West Virginia will expand to serve all 55 counties by April 2017. Learn more at http://safe.wvdhhr.org. DHHR’s Bureau for Children and Families has a webpage dedicated to the Safe at Home West Virginia program. Visit http://safe.wvdhhr.org to find helpful resources including manuals, policies, forms, newsletters and more. Community-based treatment is the heart of DHHR’s Safe at Home program. Did you know? Safe at Home West Virginia is changing services to better meet needs. 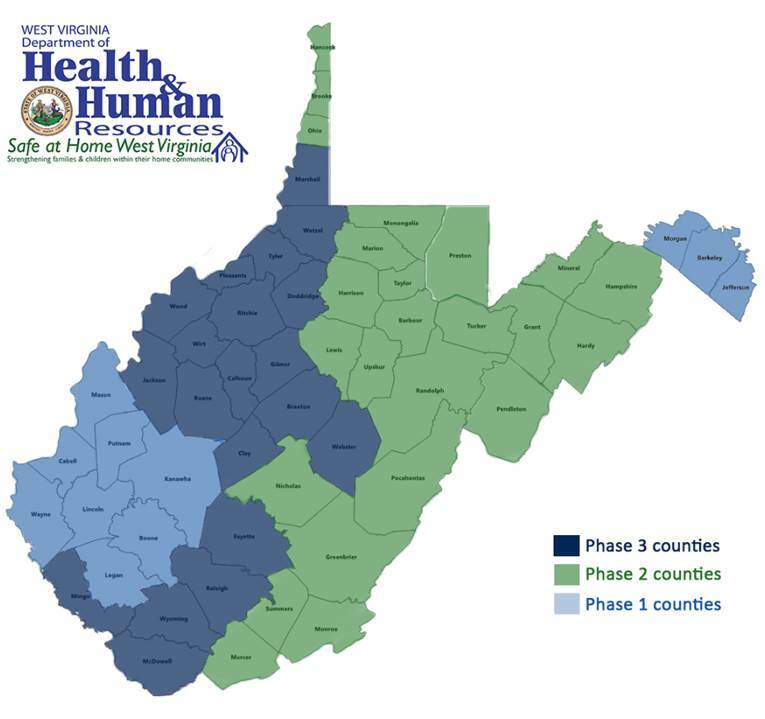 You can stay up to date on Safe at Home West Virginia by liking the West Virginia Department of Health and Human Resources on Facebook and following @WV_DHHR on Twitter. Did you know? According to the Centers for Disease Control and Prevention, safe, stable and nurturing relationships and environments can have a positive impact on a broad range of health problems and on the development of skills that will help children reach their full potential. That’s why Safe at Home West Virginia is so important. Learn more at http://safe.wvdhhr.org. It is strongly rooted in family engagement and engaging community support to provide services individually designed to meet the complex needs of children and families. Elements of the service model include assessments, care coordination, planning and implementation, and transitioning families to self-sufficiency. It is focused on a single coordination plan for the child and family. The Safe at Home West Virginia wraparound services intervention helps improve identification of a youth’s and family’s strengths and needs; reduces the reliance on congregate care and length of stay in congregate care; reduces the reliance on out-of-state residential care; improves the functioning of youth and families, including educational attainment goals for older youth; improves timelines for family reunification; and reduces re-entry into out-of-home care. and 25 have returned to their community from shelter placement. Safe at Home West Virginia remains a valuable program to many youth across the state. success of youth in their home communities. In the two years since Safe at Home was launched, 1,120 youth have been referred to the innovative program for services. As of September 2017, 672 youth have been prevented from entering residential placement; 167 have returned to their communities from in-state residential placement; 57 have returned to West Virginia from out-of-state residential placement; and 15 have returned to their community from shelter placements. Safe at Home West Virginia was implemented one year ago. DHHR Cabinet Secretary Karen L. Bowling talks about the journey in the latest newsletter: http://bit.ly/2ecxjAj. In the latest newsletter, a Safe at Home facilitator shares an inspirational story of how the program’s wraparound supports helped one young man overcome obstacles at home and school. Read more at http://bit.ly/2ecxjAj. UPDATES – Did you know? Safe at Home changed everything for DHHR’s Bureau for Children and Families. Learn more at http://bit.ly/2ecxjAj. The program’s trauma-informed approach and focus on preventing re-traumatization helps us look at the root cause of behaviors so that true, long-lasting change can be made. 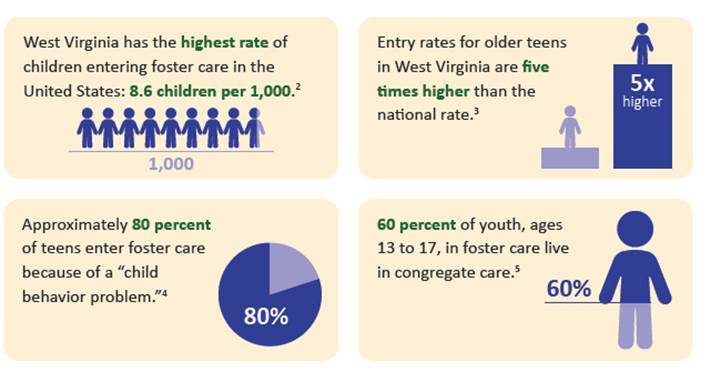 Why must we work together to improve outcomes for youth in West Virginia? The statistics are alarming. While experts recommend that youth be cared for in the most family-like setting possible,1 too many West Virginia teens enter group homes. 1 U.S. Department of Health and Human Services, Administration for Children and Families, Children’s Bureau. (2015). A National Look at the Use of Congregate Care in Child Welfare. Retrieved from http://www.acf.hhs.gov/sites/default/files/cb/cbcongregatecare_brief.pdf. | 2 Adoption and Foster Care Analysis and Reporting System (AFCARS), Fiscal Year (FY) 2012. | 3 AFCARS, FY 2012. | 4 AFCARS, FY 2013. | 5 AFCARS, FY 2013. A West Virginia family was struggling to meet their son’s needs, but an innovative approach helped keep the child at home. Community-based treatment is the heart of DHHR’s Safe at Home program. Learn more about Safe at Home by watching this segment of the State of Health on our YouTube channel, http://bit.ly/29ight0. Behavioral health experts say DHHR’s Safe at Home program gives families hope and helps keep at-risk children and families together. “We begin to ask different questions. Instead of saying, ‘What’s wrong with this child’ or ‘What’s wrong with this family,’ we ask, ‘What’s happened to you,’ ‘What’s happened to the child,’ ‘What’s happened to the family.’ And we look at the context of the family system and what’s happening within the family.” Learn more about Safe at Home West Virginia on this segment of DHHR’s TV show, State of Health, http://bit.ly/29i3vuf. Lives like that of a young man who spent eight years in residential treatment facilities are being impacted by Safe at Home West Virginia. After being referred to the program, staff traveled 13 hours to bring this child back to his home state of West Virginia. He’s now thriving in a foster placement and has expressed how much he loves his new family. To help him adjust to public school, his teachers have worked closely with the wraparound facilitator to develop a transition plan. While it is uncertain where the supports and guidance offered through the Safe at Home program will take him, it is evident that he has an improved opportunity to lead a safe, healthy and successful life right here in the Mountain State. More than 700 youth have been referred to Safe at Home West Virginia for wraparound, a process that supports families by bringing a group of people together as a team for planning and delivering supportive services. Learn more at http://safe.wvdhhr.org. Did you know? To date, 419 youth have been referred to Safe at Home West Virginia for wraparound services. 2 have returned to his/her community from shelter placement. To date, 366 youth have been referred to Safe at Home West Virginia for wraparound services. To date, 274 youth have been referred to Safe at Home West Virginia for wraparound services. REPORT UPDATE May 2016: Since implementation in October of 2015, Safe at Home West Virginia has helped many children and their families. We are beginning to celebrate success stories like that of a young man was in and out residential placements for more than a year. While at these facilities, he was not cooperative with treatment and often ran away. Last fall, he left the state to receive treatment. Upon considering the benefits of Safe at Home, the child was referred to the program and was returned to his mother. A Pressley Ridge wraparound facilitator worked with the mother to help her effectively guide the child. This wraparound facilitator also worked with the child’s school to develop an appropriate education plan. Through supports offered by BCF, Pressley Ridge and partners, this youth is growing in a familiar, yet improved home setting where his mother now understands how to help him. REPORT UPDATE April 2016: To date, 132 youth have been referred to Safe at Home West Virginia for wraparound services. Of those, 17 youth have returned to West Virginia; 23 have moved back to their home communities from in-state residential placements; and 37 have been prevented from entering residential placements. There are four phases in the wraparound process. One of the first people your family will meet is a Wraparound Facilitator. The Wraparound Facilitator will inform you about Wraparound and determine if the process can meet the needs of your child and family. 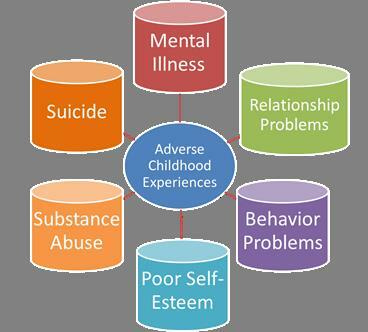 A critical part of the wraparound process is the Child and Adolescent Needs and Strengths assessment (CANS). The Wraparound Facilitator will meet with your family to begin the assessment and planning process. The purpose of the CANS assessment is to help determine the various needs that your at-risk youth may have that will need to be addressed in the planning process. This assessment will be revisited several times throughout the wraparound process and will help guide the team in understanding progress and new needs that may arise during treatment. During this process you should discuss your concerns, needs, hopes, dreams, and strengths with your Wraparound Facilitator. You should then describe your vision for the future and identify people who care about you and your family. You, your family and your Wraparound Facilitator will discuss who should come to your Family Team Meeting to develop a plan and when and where the Child and Family Team Meeting should occur. o Team members may include community or family members who care about you as a family and want to see you succeed, such as friends, neighbors, relatives, pastor, etc. Other members will include people who are providing services such as Service Providers, DHHR Worker, Probation Officer, or teachers. o The time and place for each meeting will be determined by what is convenient for you and your family, and practical for the other team members involved. Together you may choose to have a meeting at your home and avoid having to find baby sitters or driving long distances. On the other hand, you may choose a location away from home to help focus efforts on the task of developing your plan. Possible locations may include a service provider’s office, community building, church, library or a local park. o Family members are treated as peers and are the experts about their own family throughout the wraparound process. Finalize a “Service Plan” (also called the Wraparound Plan). Planning is grounded in family members’ perspectives, and the team strives to provide options and choices such that the plan reflects family values and preferences. Assign additional tasks (if necessary) to team members. Encourage input from family and service providers on setting goals, reviewing progress and planning for the future. These areas will be included in Monthly Progress Reports that will be submitted to the West Virginia Department of Health and Human Resources, the multidisciplinary team and the Court (if applicable). The family will also receive a copy of their report. As the Child and Family Team develops the right mix of strategies, interventions and supports, the team will see goals being accomplished. When these goals are met and the team determines the family no longer needs the supports of the wraparound program, the family will be formally discharged from the program. With this in mind, the team will begin discharge planning during the initial meetings. Through brainstorming and discussion, the team will identify options that will help and support the family following discharge. During this transition phase, the family will also begin discussing after-care planning. After-care is a time to fully practice what has been discussed in the Family Team Meetings and to continue the accomplishments and goals of the Service Plan. Some of the wraparound supports will continue to be available, but the Wraparound Facilitator will gradually reduce their weekly contact. Once the family has begun the after-care portion of the wraparound plan, the Wraparound Facilitator will set up a schedule of a short series of calls to check in with the family, conduct brief surveys and follow-up on the child’s/youth’s progress. There are 10 philosophical principles of wraparound that provide the basis for understanding this widely-practiced service delivery model, which will be used to deliver services through the Safe at Home project. Family and youth/child perspectives are intentionally elicited and prioritized during all phases of the wraparound process. Planning is grounded in family members’ perspectives, and the team strives to provide options and choices such that the plan reflects family values and preferences. The wraparound team implements service and support strategies that take place in the most inclusive, most responsive, most accessible, and least restrictive settings possible; and that safely promote child and family integration into home and community life. The team ties the goals and strategies of the wraparound plan to observable or measurable indicators of success, monitors progress in terms of these indicators, and revises the plan accordingly. · External customers are the people you do business with outside of your agency. They are the people you serve, collaborate with, and with whom you interact and share your expertise. They include children, youth, birth parents, and extended family members. External customers also include courts and legal professionals, Tribes, contract agencies, cross-system collaborators, advocates, and other community partners. · Internal customers are the people you work with throughout your agency. They are colleagues, staff members in other agency divisions, and other peers who provide services to you or to whom you provide services (e.g., the financial department staff, licensing workers, data staff, etc.). Put more simply, every staff member within the agency, from the custodian to the highest level administrator, is an internal customer. Both internal and external customers have expectations about what their relationship and experi­ence with an agency should be, and expectations of what services an agency should provide. As agencies consider how the term “customer” applies to foster, adoptive, and kinship families, they should recognize the unique role that these families play in the child welfare field and the unique relationship that families have with child welfare agencies. These families have characteristics of both internal and external partners, which means they experience being internal and external cus­tomers—sometimes simultaneously—depending on the status of their relationship with the agency and the dynamics of each care-giving situation. They are both an external resource to be sought out and treasured, and an internal partner to be respected as an essential member of the child and fam­ily serving team. Even when functioning as internal partners, caregivers generally hold less power than agency staff and are more vulnerable due to the emotional and legal complexities inherent in their status. WV has the highest entry rate in the nation (8.6 children per 1,000 compared to a national entry rate of 3.3 in FY12). Bureau for Children and Families is working to improve this statistic with the Safe at Home project, which will target entries. In addition, the demonstration will initially serve 12-17 year olds. 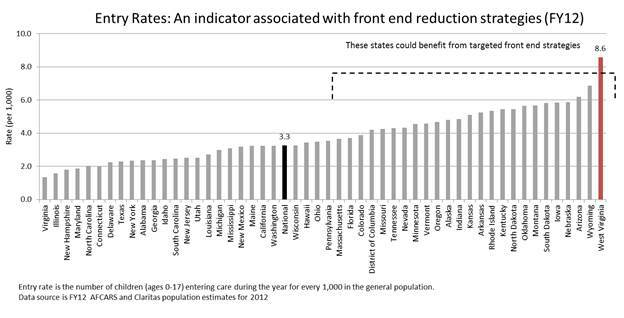 In WV, older youth enter care at rates similar to infants. Entry rates for older teens in WV are about five times higher than the entry rates for older youth nationwide. About 80% of the teens entering care in FY13 in West Virginia had removal reasons of “child behavior problem” – an indicator that trauma-informed behavioral health services are needed. Get to know the resource families who care for the children in your custody. Be sure that you understand what foster, adoptive, and kinship families do, and make it clear to them that you understand the importance of their role. Be friendly to resource families. Model positive, respectful interactions with resource families when you see them in the building, at meetings, or in public. Be available to speak with families upon request. Front line workers should be responsible for most exchanges with resource families, and for building the trust that is necessary for a successful working relationship with them. However, it can be reassuring to both workers and resource families to know that directors are always available if outside brainstorming is needed or to help problem solve a specific situation. At the same time, avoid over involvement—if a director is too involved, a direct worker can be disempowered. Give out your contact information. Any time you have contact with a foster, adoptive, or kinship family, give them your contact information so they can reach you directly for help if necessary. Consider resource families in all you do, from writing policy to writing a memo. Include the foster, adoptive, and kinship family perspective in all materials you produce, all speeches you give, all meetings you have with those you supervise, and any time you interact with the community. There are 10 principles that guide Safe at Home West Virginia’s wraparound process. Family and youth are intentionally elicited and prioritized during all phases of the wraparound process, a model used in Safe at Home WV. Planning is grounded in family members’ perspectives, and the team strives to provide options and choices so that the plan reflects family values and preferences. The wraparound process recognizes the importance of long-term connections between people, particularly the bonds between family members. 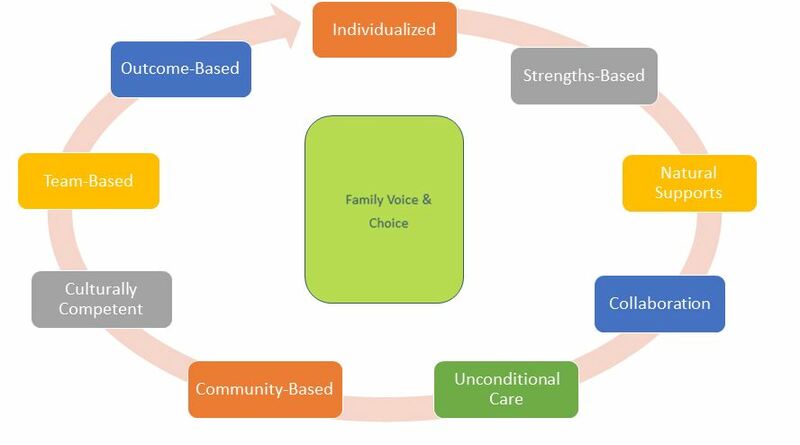 The principle of family voice and choice in wraparound stems from this recognition and acknowledges that the people who have a long-term, ongoing relationship with a child or youth have a unique stake in and commitment to the wraparound process and its outcomes. With an emphasis on family engagement, Safe at Home WV recognizes that a young person who is receiving wraparound also has a unique stake in the process and its outcomes. The principle of family voice and choice affirms that these are the people who should have the greatest influence over the wraparound process as it unfolds. The Safe at Home WV model emphasizes the importance of family engagement, recognizing that the likelihood of successful outcomes and youth and family ownership of the wraparound plan are increased when the wraparound process reflects family members’ priorities and perspectives. The principle thus explicitly calls for family voice—the provision of opportunities for family members to fully explore and express their perspectives during wraparound activities—and family choice—the structuring of decision making such that family members can select, from among various options, the one(s) that are most consistent with their own perceptions of how things are, how things should be, and what needs to happen to help the family achieve its vision of well-being. Safe at Home WV is based on the National Wraparound Initiative, and is a collaborative process; however, within that collaboration, family members’ perspectives must be the most influential. The principle of voice and choice explicitly recognizes that the perspectives of family members are not likely to have sufficient impact during wraparound unless intentional activity occurs to ensure their voice and choice drives the process. Families of children with emotional and behavioral disorders are often stigmatized and blamed for their children’s difficulties. This and other factors—including possible differences in social and educational status between family members and professionals, and the idea of professionals as experts whose role is to “fix” the family—can lead teams to discount, rather than prioritize, family members’ perspectives during group discussions and decision making. These same factors also decrease the probability that youth perspectives will have impact in groups when adults and professionals are present. Furthermore, prior experiences of stigma and shame can leave family members reluctant to express their perspectives at all. Putting the principle of youth and family voice and choice into action in the Safe at Home WV project requires intentional activity that supports family members as they explore their perspectives and as they express their perspectives during the various activities of wraparound. Further intentional activity must take place to ensure that this perspective has sufficient impact within the collaborative process, so that it exerts primary influence during decision making. The wraparound process recognizes that the families who participate in wraparound, like American families generally, come in many forms. In many families, it is the biological parents who are the primary caregivers and who have the deepest and most enduring commitment to a youth or child. In other families, this role is filled by adoptive parents, step-parents, extended family members, or even non-family caregivers. In many cases, there will not be a single, unified “family” perspective expressed during the various activities of the wraparound process. Safe at Home WV’s wraparound model is intended to be inclusive and to manage disagreement by facilitating collaboration and creativity; however, throughout the process, the goal is always to prioritize the influence of the people who have the deepest and most persistent connection to the young person and commitment to his or her well-being. Special attention to the balancing of influence and perspectives within wraparound is also necessary when legal considerations restrict the extent to which family members are free to make choices. This is the case, for example, when a youth is on probation, or when a child is in protective custody. In these instances, an adult acting for the agency may take on caregiving and/or decision making responsibilities vis-à-vis the child, and may exercise considerable influence within wraparound. Wraparound is a collaborative process undertaken by a team. The wraparound team should be composed of people who have a strong commitment to the family’s well-being. In accordance with principle 1, choices about who is invited to join the team should be driven by family members’ perspectives. At times, family members’ choices about team membership may be shaped or limited by practical or legal considerations. For example, one or more family members may be reluctant to invite a particular person— e.g., a teacher, a therapist, a probation officer, or a non-custodial ex-spouse— to join the team. At the same time, not inviting that person may mean that the team will not have access to resources and/or interpersonal support that would otherwise be available. Not inviting a particular person to join the team can also mean that the activities or support that he or she offers will not be coordinated with the team’s efforts. This principle recognizes the central importance of the support that a youth/child, parents/caregivers, and other family members receive “naturally,” i.e., from the individuals and organizations whose connection to the family is independent of the formal service system and its resources. These sources of natural support are sustainable and thus most likely to be available for the youth/child and family after wraparound and other formal services have ended. People who represent sources of natural support often have a high degree of importance and influence within family members’ lives. These relationships bring value to the wraparound process by broadening the diversity of support, knowledge, skills, perspectives, and strategies available to the team. Such individuals and organizations also may be able to provide certain types of support that more formal or professional providers find hard to provide. The primary source of natural support is the family’s network of interpersonal relationships, which includes friends, extended family, neighbors, co-workers, church members, and so on. Natural support is also available to the family through community institutions, organizations, and associations such as churches, clubs, libraries, or sports leagues. Professionals and paraprofessionals who interact with the family primarily offer paid support; however, they can also be connected to family members through caring relationships that exceed the boundaries and expectations of their formal roles. When they act in this way, professionals and paraprofessionals too can become sources of natural support. Practical experience with wraparound has shown that formal service providers often have great difficulty accessing or engaging potential team members from the family’s community and informal support networks. Thus, there is a tendency that these important relationships will be underrepresented on wraparound teams. This principle emphasizes the need for the team to act intentionally to encourage the full participation of team members representing sources of natural support. Wraparound is a collaborative activity—team members must reach collective agreement on numerous decisions throughout the wraparound process. For example, the team must reach decisions about what goals to pursue, what sorts of strategies to use to reach the goals, and how to evaluate whether or not progress is actually being made in reaching the goals. The principle of collaboration recognizes that the team is more likely to accomplish its work when team members approach decisions in an open-minded manner, prepared to listen to and be influenced by other team members’ ideas and opinions. Team members must also be willing to provide their own perspectives, and the whole team will need to work to ensure that each member has opportunities to provide input and feels safe in doing so. As they work to reach agreement, team members will need to remain focused on the team’s overarching goals and how best to achieve these goals in a manner that reflects all of the principles of wraparound. The principle of collaboration emphasizes that each team member must be committed to the team, the team’s goals, and the wraparound plan. For professional team members, this means that the work they do with family members is governed by the goals in the plan and the decisions reached by the team. Similarly, the use of resources available to the team—including those controlled by individual professionals on the team—should be governed by team decisions and team goals. This principle recognizes that there are certain constraints that operate on team decision making, and that collaboration must operate within these boundaries. In particular, legal mandates or other requirements often constrain decisions. Team members must be willing to work creatively and flexibly to find ways to satisfy these mandates and requirements while also working towards team goals. that safely promote child and family integration into home and community life. The wraparound process demonstrates respect for and builds on the values, preferences, beliefs, culture, and identity of the child/ youth and family, and their community. The perspectives people express in wraparound—as well as the manner in which they express their perspectives—are importantly shaped by their culture and identity. In order to collaborate successfully, team members must be able to interact in ways that demonstrate respect for diversity in expression, opinion, and preference, even as they work to come together to reach decisions. This principle emphasizes that respect toward the family in this regard is particularly crucial, so that the principle of family voice and choice can be realized in the wraparound process. This principle recognizes that a family’s traditions, values, and heritage are sources of great strength. Family relationships with people and organizations with whom they share a cultural identity can be essential sources of support and resources; what is more, these connections are often “natural” in that they are likely to endure as sources of strength and support after formal services have ended. Such individuals and organizations also may be better able to provide types of support difficult to provide through more formal or professional relationships. Thus, this principle also emphasizes the importance of embracing these individuals and organizations, and nurturing and strengthening these connections and resources so as to help the team achieve its goals, and help the family sustain positive momentum after formal wraparound has ended. This principle implies that the team will strive to ensure that the service and support strategies that are included in the wraparound plan also build on and demonstrate respect for family members’ beliefs, values, culture, and identity. The principle requires that team members are vigilant about ensuring that culturally competent services and supports extend beyond wraparound team meetings. Practical experience with wraparound has shown that when families are able to fully express their perspectives, it quickly becomes clear that only a portion of the help and support required is available through existing formal services. Wraparound teams are thus challenged to create strategies for providing help and support that can be delivered outside the boundaries of the traditional service environment. Moreover, the wraparound plan must be designed to build on the particular strengths of family members, and on the assets and resources of their community and culture. Individualization necessarily results as team members collaboratively craft a plan that capitalizes on their collective strengths, creativity, and knowledge of possible strategies and available resources. A wraparound team does not give up on, blame or reject children, youth and their families. When faced with challenges or setbacks, the team continues working towards meeting the needs of the youth and family and towards achieving the goals in the wraparound plan until the team reaches agreement that a formal wraparound process is no longer necessary. This principle emphasizes that the team’s commitment to achieving its goals persists regardless of the child’s behavior or placement setting, the family’s circumstances, or the availability of services in the community. This principle includes the idea that undesired behavior, events, or outcomes are not seen as evidence of youth or family “failure” and are not seen as a reason to reject or eject the family from wraparound. Instead, adverse events or outcomes are interpreted as indicating a need to revise the wraparound plan so that it more successfully promotes the positive outcomes associated with the goals. This principle also includes the idea that the team is committed to providing the supports and services that are necessary for success, and will not terminate wraparound because available services are deemed insufficient. Instead, the team is committed to creating and implementing a plan that reflects the wraparound principles, even in the face of limited system capacity. Before a child has even returned or left home for an out-of-home placement, a Wraparound Facilitator will contact the family to introduce his/her self, meet the family, and explain what the family can expect from involvement in the wraparound process. The Wraparound Facilitator will explain the wraparound process and how it progresses through four phases. One of the first people a family will meet is a Wraparound Facilitator. The Wraparound Facilitator will inform the family about Wraparound and determine if the process can meet the needs of the child and family. A critical part of the wraparound process is the Child and Adolescent Needs and Strengths assessment (CANS). The Wraparound Facilitator will meet with the family to begin the assessment and planning process. The purpose of the CANS assessment is to help determine the various needs that an at-risk youth may have that will need to be addressed in the planning process. This assessment will be revisited several times throughout the wraparound process and will help guide the team in understanding progress and new needs that may arise during treatment. During this process the family should discuss concerns, needs, hopes, dreams, and strengths with the Wraparound Facilitator. The family should then describe their vision for the future and identify people who care about the family. During this phase, the family and Wraparound Facilitator will discuss who should come to the Family Team Meeting to develop a plan and when and where the Child and Family Team Meeting should occur. Team members may include community or family members who care the family, such as friends, neighbors, relatives, pastor, etc. Other members will include service providers, the DHHR worker, probation officer or teachers. The time and place for each meeting will be determined by what is convenient for the family, and practical for the other team members involved. Together, the family may choose to have a meeting at home and avoid having to find babysitters or driving long distances. On the other hand, the family may choose a location away from home to help focus on developing the plan. Possible locations may include a service provider’s office, community building, church, library or a local park. Family members are treated as peers and are the experts about their own family throughout the wraparound process.